In addition to The Washington Post, several other major newspapers have recently been purchased, with the sales prices revealing a heavy devaluation of the product. Only days before The Post sale, , The New York Times accepted an offer for $70 million from the Boston Red Sox’s principal owner to buy The Boston Globe – a 95% decline in value from when The New York Times first bought the Globe in 1993 for $1.1 billion. The last time The Washington Post was sold was back in 1933 (for $825,000), but its current selling price of $250 million is even less than the $295 million the Times paid for the weekly Worcester Telegram & Gazette in 1999. 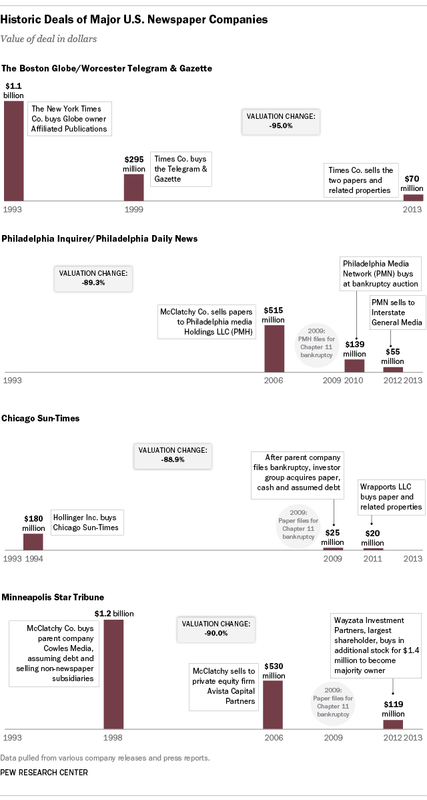 Here we offer a snapshot of recent newspaper sales and what they tell us about depreciation in the industry.